Bert Brown is fed up with being a bus driver until one day something amazing happens. He finds a tiny angel in his pocket. Perhaps he and his wife Betty have found the son they long for. They name this (rather flatulent yet very appealing) mini angel Angelino. He has an effect on everyone who meets him. Nancy and her school friends are filled with wonder, acting head teacher Mrs Mole is less than keen. Criminals Kevin and the Boss, capture him and plan to sell him to the highest bidder. Scary Basher Malone wants to gobble him up. How will Nancy and her friends rescue him? 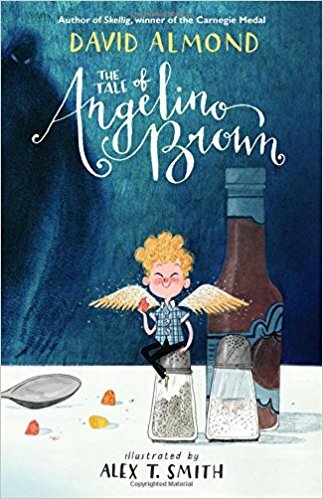 This is a charming and delightfully illustrated story about wonder, magic, mystery and the power of imagination. It will encourage reflection about bullies and why they behave as they do, the importance of childhood experiences, dreams and how they may stay with us. A story which celebrates imaginative free expression through the creative arts likely to encourage lots of painting, model making and storytelling. A hint of criticism about an over rigid curriculum perhaps! We both really enjoyed this book. Dylan was hooked straight away with the early arrival of the angel in the story. And just as the characters in the book accept this as something ‘possible’, so did Dylan. He loved the humour of the cheeky little angel and of course couldn’t resist the giggles when Angelino had wind troubles! He also liked talking about the characters in the book and we enjoyed playing ‘guess the character’, taking it turns going into role. It’s especially good fun taking on the role of a strict headteacher. Later in the story we had discussions about friendship, family relationships, whether or not the baddies were ‘really bad’ and why people behave in the ways they do, or become the people they are. He had many ideas about why the angel came suggesting it was to spread some happiness, help Bert and Betty after they lost their child or because Angelino was Bert and Betty’s boy that had died. 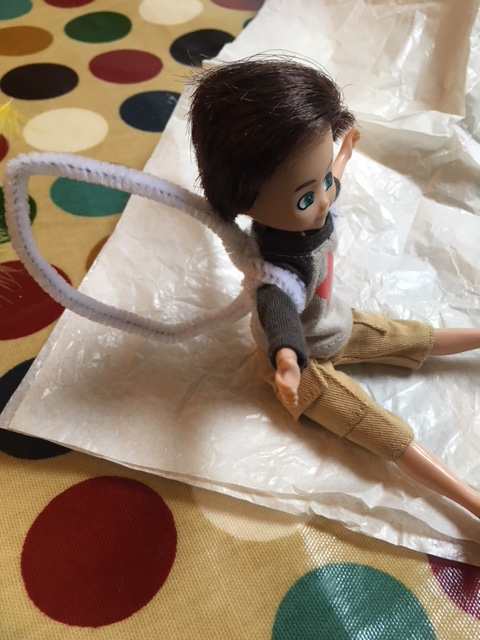 Dylan was keen to make his own Angelino by adding some wings to his doll. 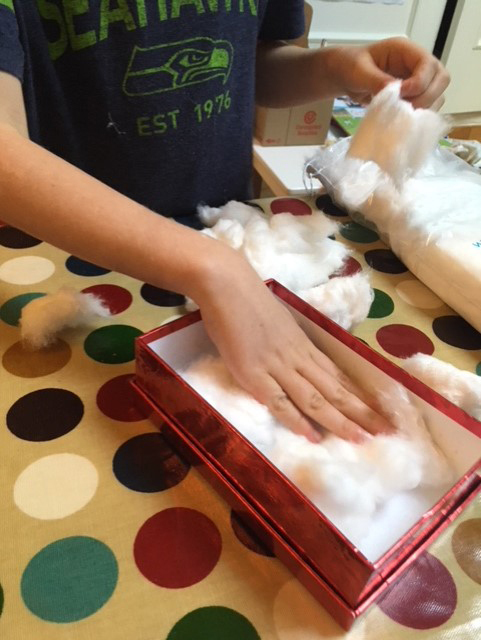 He reread the section where Betty makes a bed from a box and searched for a box which would be the right size, and some cotton wool and a cloth for bedding. His sister also enjoyed joining in at this stage and wanted to turn her doll into an angel too to be ‘a friend for Angelino’. Overall the book was a great success. Funny, exciting, sad and thought provoking in equal measure. And of course perfect for those of us who’ve worked in education; David Almond hits the nail on the head with his description of life in school! Which chapter or scene in the book did you like best? Read them again and talk about why you like them. Talk about the character/s. Which are the most interesting? How do Nancy, Kevin, Bert or other characters feel at different points in the story? Does anything about this story remind your child of any other stories they know? Talk about Smellie and Nutt’s rules for school in chapter 46 – see if you can think together of some better ones? Look at images of wings and draw some carefully on card or stiff paper. Cut them out and stick onto a small doll or toy. Children could make a mini bed for their little angel from a box like Betty and Bert do. This is easiest with a group of people but conversations between a couple of characters can be easily done if you join in with your child. Take turns pretending to be one of the characters from the story. Write another story about Angelino or, as the author suggests, Basher Malone’s story ‘The Salvation of Basher Malone’. Maybe he stumbles upon Angelino or another angel and changes for the better. Have a another look at Smellie and Nutt’s rules in chapter 46 then have a go at your own for a school that might be more fun. *With thanks to Lauren and Dylan for adding these talk and activity ideas. 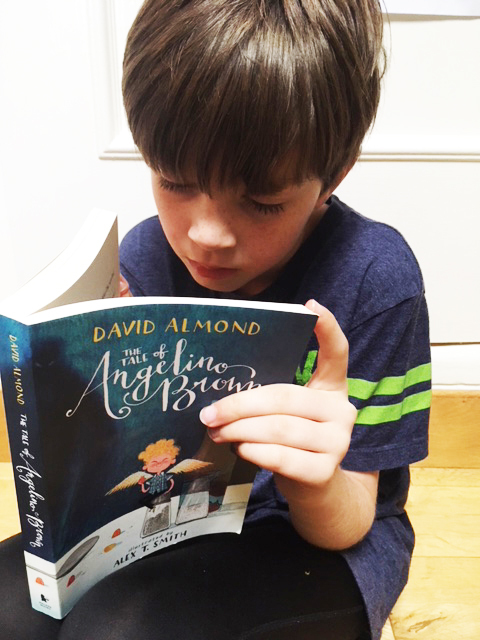 Read more books our patron David Almond. For older children Skellig award winning modern classic book about a mysterious angel-like creature. Claude in the City the first in the series of Claude stories. Bert tells Angelino the story of a wooden boy who came to life – Pinocchio.